According to recent polls, more than a third of self-identified white evangelical voters currently support a presidential candidate, Donald Trump, who touts a false story about an American general executing Muslim terrorists with bullets dipped in pig blood as inspirational for the future of American foreign policy (and who endorses the killing of non-combatants in the fight against ISIS). Another one in five white evangelical voters currently support Ted Cruz, who has suggested carpet bombing Syria, saying, “I don’t know if sand can glow in the dark, but we’re going to find out.” These kinds of numbers suggest that American evangelicalism has a serious discipleship problem when it comes to the ethics of war and peace, and the name of that problem is not pacifism. Were the songs, video games, and radio talk shows that prompt popular sentiment more tragic in the classical sense, it might have been possible to imagine that the problem is the persistence of a pagan warrior honor ethos untempered by acquaintance with the long centuries of just war discourse since Augustine. Instead, I believe that many evangelicals have succumbed to a politics of the gut that has little to do with serious moral formation of any kind. The political sentiments reported in polls like these suggest a dismal but unsurprising possibility: that very few American evangelical churches offer their members the opportunity of a discipleship that gives attention to the history of Christians over the past two millennia struggling to follow Jesus in their times and places. 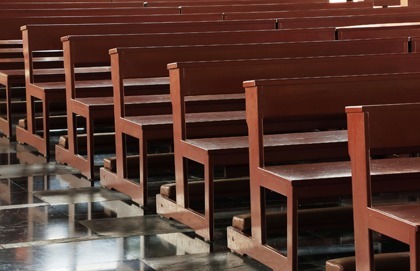 Dismal because such a discipleship—alongside sacramentally-centered worship and Jesus-centered public proclamation of the good news of the reign of God—is what constitutes the life of a church. Unsurprising because shallow and misguided discipleship is a persistent reality in the life of churches recorded already in the Acts of the Apostles and the letters of Paul and his fellow epistolators. This possibility does not call for pride (in the superiority of my own political judgment), scorn (towards morally misguided evangelical voters), disgust (at the pandering polemics perpetrated by Messrs. Trump and Cruz), or despair (at the dismal state of discipleship in so many Christian congregations). Instead, it calls for repentance (of my own arrogance), compassion (towards the many people bereft of congregations with a long memory of Christian discipleship), intercession (for the work of the Holy Spirit in the lives of all of America’s present and aspiring political officeholders), and catechetical resolve (to contribute to discipleship in those congregations where I am able to make a difference). At depth the problem is not the politics of evangelicals or the nominalism of many self-identified Christians or the secularization of America in our times. The problem is the perennial distraction of Christian churches from the core practices that make them churches, or perhaps more accurately, the distortion of these practices by personal, communal sins and cultural pressures. As someone intimately familiar with the tremendous power of such sins and pressures, I also know what a grace it is to be exposed to the work of God in the celebration of baptism and the eucharist, in public prayers and worship songs, in preaching and communal Bible study, and in the dear and demanding friendship of fellow followers of Jesus. For example, last November I joined in the worship of an Anglican church in Canada on Remembrance Sunday. As has been their practice for long decades, a reserve infantry regiment joined the congregation on that day. In the sermon the priest recognized that many of the soldiers did not share the church’s faith in Christ (so, on this occasion, one of the soldiers wore a Sikh turban as the Canadian military allows), but nonetheless explored the meaning of a specifically Christian understanding of just war doctrine in relation to Jesus’ eschatological proclamation in Mark 13, “When you hear of wars and rumors of wars, do not be alarmed. Such things are bound to happen; but the end is still to come.” That Sunday has come to mind time and again in the months since. Some aspects of the worship service made me uncomfortable, including the regiment marching up the nave and the presentation of the regimental colors during the service. Other parts of the service moved me deeply, including the prayers of remembrance for soldiers who had in recent years lost their lives in the exercise of their duties. I’ve frequently wondered since about the formative effect on the lives of members of that congregation, over years, of such Remembrance Sunday services. The shaping of their beliefs, desires, imaginations in this juxtaposition of regiment and church in prayer before God, between the baptismal font and the eucharistic table, in the hearing of the biblical Scriptures and in their exposition. I know that my moral formation depends on being regularly confronted thus with the juxtaposition of the world as it is with the world to come, in common worship before the face of God, and in commemoration of millennia of Christian public discipleship. Lest my own civic impulses be reduced to an itch for pig-blooded bullets and glowing sand. This article first appeared on providencemag.com, the website of Providence: A Journal of Christianity & American Foreign Policy.